Redline In-Line Radiator Filter - available in 1 1/4", 1 1/2" and 1 3/4"
What particles are floating around in your coolant system? All this results in clogging the fine tubes which comprise your radiator core and over time block your radiator. High temperature glass fibre impregnated material is rugged and will withstand the full range of automotive cooling system temperatures. Triangular shaped stainless steel filter screen ensures constant flow of coolant. Screw top for easy servicing. Sludge collector lifts out for easy cleaning. Extends the life of your radiator by filtering contaminants that can block cores and collecting in tanks. 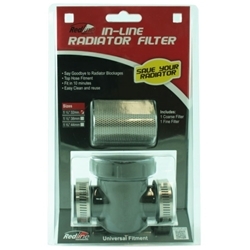 SAVE your radiator from blockages by installing a Redline in-line radiator filter in your top radiator hose. Two filter screens, 1 coarse and 1 fine screen. Spare ‘O’ ring for filter lid.